When you want to enjoy a fascinating experience on some of the best of Branson outdoors in the Ozark region, don’t miss to visit the Marvel Cave. This beautiful cave is one of the greatest wonders in the Midwest that evolved around the entrance to the Silver Dollar City theme park in Branson. Marvel Cave was opened in 1894 as an Ozarks tourist attraction by a Canadian entrepreneur William Henry Lynch. It was used as a tourist show cave for more than five decades. In 1950, the cave was leased by Hugo Herschend, a Danish immigrant from Chicago. By 1960, Silver Dollar City was built near the entrance to the cave and it continued to be a popular destination in Branson. Ever since Marvel Cave was opened in 1894, it has been attracting visitors with its interesting history, mysterious darkness and the breathtaking beauty it holds underneath the Earth’s surface. What is now the foundation and the entrance of the popular amusement park, Silver Dollar City, is a cave that was first discovered by the Osage Indians. Discovered by a curious dog in 1862, the fantastic cave has been giving fun and entertainment to explorers for over one and a half century. Guests travelled to the cave in comfortable jeep-drawn trams due to the fragility of the cave. The beautiful and enormous natural spectacles filled the cave with pearls, massive columns, flowstones, and more. The cave is a perfect place to bring the whole family while you’re visiting Branson. The only ride-through cave in America, Marvel Cave requires no walking and the cave’s temperature stays around 60 degrees Fahrenheit year-round. During the early days of the 15th century, the Marvel Cave was first discovered by the Osage Indians. When they were hearing strange noises arising from deep within the entrance, the early settlers feared the cave, never entered it, and they named the place as “The Devil’s Den”. In 1541, upon discovering the place, the Spanish explorers entered the cave hoping to find riches but nothing found. The next exploration to the cave occurred in 1869 and the explorers descended into the cave to look for valuable mineral deposits. Then a group of miners headed by Henry T. Blow, traveled by horseback to the entrance of the Devil’s Den. The miners carried lanterns and studied the cave walls and carefully searched for signs of mineral deposits. The miners surfaced late in the evening, failed to find the lead ore they sought, but they were convinced that marble could be found inside the cave. Their report sparked the interest of the locals and decided to rename the cave, Marble Cave. When Mr. Lynch’s died in 1927, the name of the cave was changed from Marble to Marvel Cave as no marble was ever mined from the cave, but only bat guano. Marvel Cave played an important role for the construction of the Silver Dollar City. If not for the cave, Silver Dollar City might not have existed. In 1960, Marvel Cave became a popular place to enjoy as one of best Branson outdoors and by 1984, it became a tourist attraction. The deepest cave in Missouri can be explored in a 60-minute basic tour or a 90-minute lantern light tour once a day. Marvel Cave tour includes a ticket to Silver Dollar City. Of all the interesting caves near Branson, Marvel Cave is the nearest to Branson downtown. If you want to visit Marvel Cave, also include a plan of exploring Silver Dollar City and its amazing cave. When you visit Silver Dollar City, you will always get a ticket for a marvelous tour to Marvel Cave. The tour to the cave depart every half hour, weather permitting. 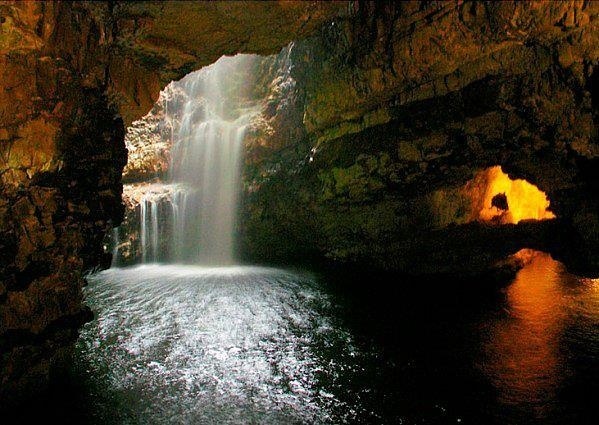 Marvel Cave is a wet limestone cave complete with formations that are still alive and growing. The cave tour starts by travelling 300 feet below the surface and enter the Cathedral Room. This awe inspiring Cathedral Room is the largest cave entrance room in the United States. The path way to the cave consists of stairs and ramps. The tour lasts approximately 60 minutes, with most of the time spent climbing nearly 600 stairs. The cave tour features a trained cave guide who will guide your journey and give you interesting and entertaining facts of geographical and historical importance of the cave. As the cave tour can be quite strenuous, it is not recommended to visitors with heart or lung conditions, bad backs, weak knees or ankles. A trained cave guide will host your journey and will answer questions you wish to raise. After descending nearly 500 feet below the surface, there’s nothing to worry on how to be back up to daylight. In 1957, cave operators installed a unique cable train designed to take cave visitors up the half mile, 1070 foot climb back to the surface! This cable train gives visitors an easy climb to get back up to a daylight. Many famous spelunkers have ventured the Marvel Cave which is Missouri’s deepest cave with rich history and interesting facts. The tour to the Marvel Cave is a unique opportunity to see mother nature where only a few become fortunate to experience the beauty and wonder of the cave. Lantern Light Tour at Marvel Cave is a great way to explore deepest and darkest secret of the cave. As you take the tour, you’ll step back in time and experience Marvel Cave just as the early explorers did by Lantern Light. The only difference now is that you can now ride on a unique cable train to take you back up to the surface. The cave guides are dressed in period costume which delight guests with historical facts and little-known stories during this nostalgic 90-minute journey each day. This Lantern Light Tour to Marvel Cave allows guests to see the Mammoth Room. This large room is located just next to the right of the guest trail in the Cathedral Room. Highlights of this Lantern Light Tour include the bat wall, the only known “Spanish ladder” left in the cave (circa 1541) and many other colorful stories. Tour begins at 4:30 p.m. when Silver Dollar City closes at 6 p.m. and when it closes at 7 p.m. the Tour begins at 5:30 p.m. The cost of the tour is $14.00 plus tax (children under 8 are not permitted on Lantern Light Tours). Tours have a limited capacity, so order online today or make your reservations early at the Cave Information Desk located in the Hospitality House at Silver Dollar City. Novelist Harold Bell Wright represented many famous spelunkers of Marvel Cave in his famous book, Shepherd of the Hills. The book was first published in 1907 and soon became the most widely read publication in Missouri. This interesting book described the lives of the people in the Ozark regions and the characters of the story and included the history of the Marvel Cave. This interesting novel about the people in the Ozarks continues to inspire people to this day where it gives readers the opportunity to learn the traditions and history in the region. If you want to discover the interesting facts and historical treasures of the Marvel Cave, don’t miss to visit this marvelous Branson outdoor and get the chance to enjoy some of several exciting activities at Silver Dollar City’s 1800s style theme park.